Samsung is continuing with a second generation foray into the 58" plasma arena to do battle with Panasonic. This new PN650 series from Samsung is hot looking (and also creates a lot of heat while operating). It's got some very nice feature upgrades over the 550 series by Samsung while not stepping on the price too much – making it a very attractive quality/value play in this size of plasma. The features on the PN58A650 are fairly robust with increased contrast, advanced picture settings, scrolling wheel user interface adjustments, and Samsung's new Touch of Color aesthetics. Other Settings: Black Adjust – Off, Dynamic Contrast – Off, Gamma – (-1), Color Space – Native, Flesh Tone – 0, Edge Enhancement- Off, Color Tone – Normal, HDMI Black Level – Low, Film Mode – Off, xcYCC – Off. Contrast Ratio Measurement: The PN58A650 measured an impressive 1032 to 1 pre-calibration and 1211 to 1 post calibration – while not the best tested this is an excellent result. some of the best flesh tones we've seen. 720p/1080i/1080p High Definition Picture Quality: The Samsung PN58A650 performed excellently with HD content. Though this plasma does not render a bright picture, the HD picture images in The Fifth Element demonstrated great depth and 3-dimensionality. 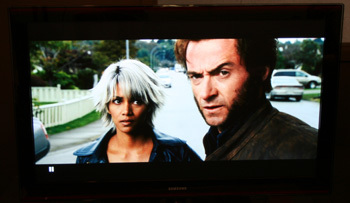 And with X-Men 3 notice the excellent video aspect ratio sizing with this decidedly dark film. The post calibration picture is warm, inviting and had some of the best flesh tones I've seen. One slight negative is that the screen does exhibit some light glare from room conditions. Notice also that the Samsung plasma’s contrast setting noted above in calibrations section is 96, which is almost at peak. The Samsung plasma has a decidedly dark but fine picture. Up conversion/Video Processing from 480i and 480p: The Samsung PN58A650 has a smooth 3:2 pulldown transition during up conversion. There is little grain and image edges show crisp. On the flip negative side, the picture appears flatter with a 480i signal and blacks get washed out to some degree. Black Level/Contrast: The PN58A650 displayed excellent black levels, but the black bars top and bottom could be seen as having a slight haziness. Avoid the Black Adjust features on this TV which electronically enhances black levels to the detriment of dark shadow detail. Dark Shadow Detail: The Samsung did a good job in this area, nothing to complain about. Color Rendition/Color Accuracy: This Samsung plasma dialed in perfectly to D6500K and produced very realistic colors. This is a big improvement over previously tested models. The PN508650 produces a fairly dark picture however, and will be best suited in rooms that have little outside light. Viewing Angle/Off Axis Viewing: Viewing angle is not a problem with this Samsung plasma with near perfect 170 degree viewing angle. Motion Lag: There was no motion lag to comment on in the PN58A650. False Contouring/ Mapping: There was the ever so slight moire’ pattern displayed by the Samsung during the Film Resolution Stadium Seating Test (otherwise called mapping or banding). We did not detect this during viewing with video content. Screen Glare: The Samsung anti glare system was mediocre in effectiveness as we detected a good bit of light glare from surrounding room conditions. This is an area that Samsung could improve upon. Exceptions: Operating Omitted Heat While the Samsung PN58A650 runs quietly, we had an issue with heat deployment from the top back vents and metal. The Samsung PN58A650 runs HOT. The top back corners are almost untouchable after using the plasma for 30 minutes. If you live in a warm climate expect to pay extra $$ just to cool the room this plasma is located in. If you're in a cold climate you might love the extra heat radiated. Aspect Ratio Sizing Considerations: This Samsung plasma gives the user control over this important dimension of picture adjustment and produced a most authentic, natural looking sized image. The PN58A650 also did a good job with natural algorithmic sizing of the images from a 16:9 DVD. The 16:9 mode automatically performed a horizontal fill. Inputs: The PN58A650 has 4 HDMI inputs, a Wise Link (USB port), network cable RJ45 input (allows viewing Samsung’s InfoLink service, an headphone output port, and a VGA 15 pin computer input. Aesthetic Considerations: The PN58A650 is a very attractive component piece with the Touch of Color signature subtle red tone coming through the 2.5" wide framing bezel. The depth of the unit is just under 4" which isnt great from a wall mount application perspective. Overall the plasma has a harmonious, high design appeal. Remote Control: The 58A650 has efficient and adequate user buttons on the remote control. The large gloss black Samsung remote has backlighting capability, plenty of functionality, and a cool dial thumb wheel feature (which is also clickable). Menu functionality: The 58A650 has discrete picture settings for each input – a very important feature since proper picture setting calibrations will be different for different inputs. The Samsung plasma has a very complete picture setting menu, allowing for more advanced calibration without accessing the service menu. It took a lot of tinkering and was a bit more difficult to navigate. One exceptional feature of the Samsung’s on screen menu is a description/definition at the bottom of the screen about what each adjustment produces/performs. This will be incredibly helpful to the average user. This plasma also has a white balance control adjustment, and color space adjustments, which we accessed to dial the color in perfectly to D6500K. Stay away from Samsungs image enhancement technology DNIe and use our calibrations instead for a more natural picture with less noise. Audio Output: We were underwhelmed by the 15W X 15W speakers on the PN58A650. Samsung claims that this plasma has SRS Tru Surround technology. If this is what SRS technology sounds like then word to the manufacturers – stay away from it. The Samsung plasma under performed in this area from its 15W X 15W speakers. Sound was thin, with little definition and bass. There is no mistaking that you are using TV speakers with the Samsung plasma. The Samsung PN58A650 is justly priced at around $3200 average from most retailers. This is only $1000 more than the 50" PN50A650. The 58" plasma screen is 33% larger than the 50" screen so the price increase is right in line with the size increase. There is only one plasma competitor in 58" and they are priced just under the Samsung with the excellent TH-58PZ700U. Otherwise, there are competitors in the 60" plasma range with LG and Pioneer competing. The LG60PG60 is a compelling choice as that companies top of the line plasma selling for around $3500.